One of the biggest problems of young fathers and mothers is when their baby cries during the night. A baby crying especially at midnight can greatly disrupt a father’s work in the office, and is a mother’s headache for a whole day. What are the common reasons most babies cry at night and what can you do about it? Well, here is a good news for those having exactly the same problem. When the baby is still inside the womb of its mother, it never cries (some may argue that they do cry, but this is more of silent crying). But once it comes out of its mother's womb, the baby will start making a loud cry. It is an expression of baby's presence. Babies do not know how to express their feeling, thus, whenever they feel hungry, lonely, and hot or cold, they express their feeling by crying. Why babies cry so much at night? The baby's brain is affected by daylight, thus, its brain rests or sleeps more during daytime. The baby's brain is more active at night and emits brain waves just like that of ionospheric wave in the sky. Therefore, babies cry often at night. The baby might be affected by a negative energy surrounding its body. The negative energy is similar to ionospheric wave in the sky. The PYRO-ENERGEN electrostatic therapy machine can eradicate this wave surrounding the baby instantly. 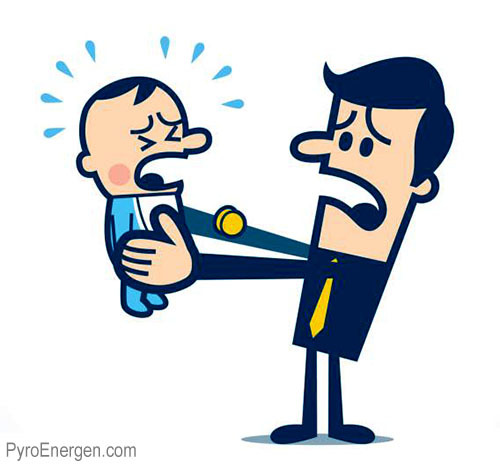 The baby will stop crying as soon as the negative energy is eradicated. Read the portion "Strange Behavioral Pattern of the Negative Energy Force Explained" to learn more on this phenomena. If your case falls at No. 2, then you can follow a simple technique below to stop the baby from crying. We tried to let babies listen to various sounds and recorded their reactions. We have tried the sounds of ocean waves, waterfalls, forests, including different music, but to no avail. Then, we found a certain sound that can make a baby rest or sleep, and of course, stop them from crying. It started one day when I was watching an entertainment TV program. It shows how a simple plastic bag (polybag) can make a sound that impresses the baby to rest! I recommended this method to several young parents who were tired of taking care of their crying babies at midnight. Results came back to me with great joy and happiness! Prepare two plastic bags. Probably, it's readily available in your kitchen or you can just purchase it at your nearby convenience store. Hold the two plastic bags and rub them together to make a noise. The baby will love this sound! It’s possible to do this even with only one large plastic bag. Make this noisy sound near the crying baby for a while. Most babies will start sleeping within one to two minutes. Amazed? Teach this method to your friends, neighbors, and relatives who have babies. They will appreciate it!